Online casinos offer a lot of blackjack games to choose from, up to the point where it can be difficult to decide which variation to play. While different players often look for different things in a blackjack game, many will agree that the best online blackjack variations have two things in common: a low house edge and a set of rules that leaves room for interesting gambling strategies. 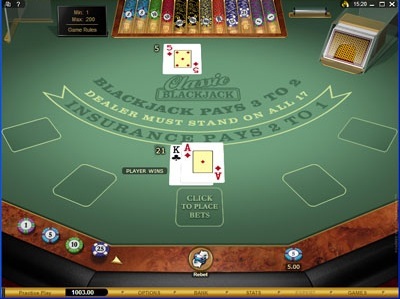 With these things in mind, we put together a short list of the finest online blackjack games. A variation in which the player is dealt two hands, this game also allows the players to switch the second cards between the hands. This innovation makes Blackjack Switch one of the best online blackjack games for experienced players. Even though players gain advantage with the switching option, the house still maintains a small edge with a few special rules: the dealer ties at 22 (instead of busting), and the blackjack payout is 1:1. This is a blackjack game with one of the lowest house edges. The rules of Atlantic City Blackjack have the dealer stand on soft and hard 17. The game also offers great double down and re-splitting options (which can vary from one online casino to another), and the players can also opt for a late surrender to prevent big losses. While it lacks the surrender option, this variant allows players to double down on 9, 10 and 11. Also, the dealer must stand on soft and hard 17. A polished, beautifully designed variant of a basic game, this is probably the best online blackjack for beginners.